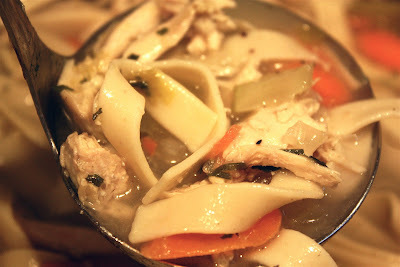 Sharing a recipe for a traditional chicken soup (ours being a chicken noodle soup) may seem a bit redundant in that most families probably have a favorite rendition of this classic that's either been passed down through generations or created anew. And regardless of whether it's a very traditional version, developed from a homemade chicken stock, or one that comes from a can, I think it's safe to surmise that chicken soup is a staple in most every home...in this country and beyond. 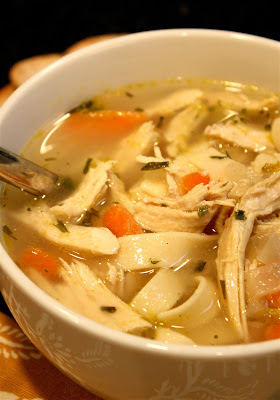 While our little version of this classic has rich egg noodles, shredded pieces of oven-roasted chicken breast, slivers of fresh carrot, slices of celery, and finely chopped bits of onion all in a mellow, flavorful, tarragon-seasoned chicken stock...there are scores of recipes that would qualify as "classic chicken soups." That being said...this one is our own quick* and satisfying go-to recipe for this comforting staple. For most people, chicken noodle soups truly do spell c-o-m-f-o-r-t. They are the soup-of-choice when you need a little something to cure what ails you...whether it's a long day, a little sniffle, or simply...the weather! With our temps back up a tad but our skies unleashing a continuous drizzle, this Roasted Chicken and Egg Noodle Soup is the perfect prescription. 1. Heat oven to 350 degrees F. Roast skin-on, bone-in chicken breasts (seasoned with salt and pepper, and lightly rubbed with olive oil) for approximately 30 to 45 minutes, until done. When ready, remove from oven and set aside to cool. 2. Heat olive oil in a large stock pot over medium heat. Add onions, cook for about 1 minute. Add carrots and celery, continue cooking until onion is soft and translucent. Sprinkle in poultry seasoning and cook for an additional 30 seconds or so. Add chicken stock (I used about 6 cups of Pacific-brand, low-sodium, organic chicken stock, 2 cups water, and 1 1/2 cubes of Harvest Sun Organic Chicken Bouillon...1 cube=2 cups stock...so yes, it's a bit more bouillon than water...but it works). Season with pepper. Add salt, to taste. Add in tarragon. 3. Simmer soup stock for about 20 to 25 minutes to allow flavors to meld. While soup is simmering, remove skin from chicken breasts, and meat from bones. Shred roasted chicken into bite-sized pieces and add to stock. Continue cooking until stock has simmered for at least 20 minutes and chicken is heated through. Add additional salt and pepper, to taste. (We often serve our soup with a sprinkle of shredded parmesan cheese on top...it adds a nice little salty, flavorful zip). Add additional stock on Day Two if your soup is a bit "thick." * "Quick" is relative here. Since this recipe does not call for a homemade chicken stock, it is "relatively" quick. It's really the time spent in roasting your chicken breasts that takes this from a 30- to 40-minute prep/cook meal, to over an hour's time. If you need to fast forward a bit, simply use a roasted chicken from the deli section of your favorite market...or pre-roast your chicken beforehand.